A while back I did a post about books I recommend to teens (and their parents). 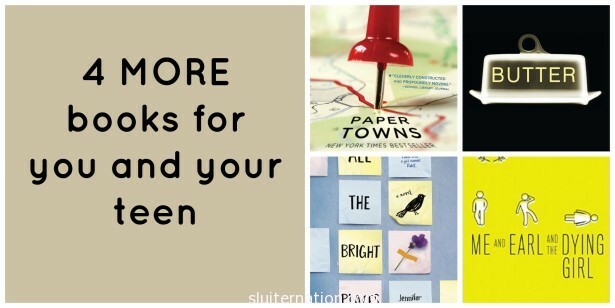 I also told you about these five books that you and your teen really need to read. Well guess what? I keep reading, so I have more recommendations! Yay! Here are four more to add to your To Read Pile and which I have added to my classroom library. 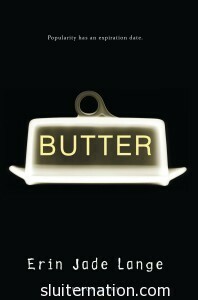 The first on my list is Butter by Erin Jade Lange. Butter is a high school junior and he weighs well over 400 pounds. Miserable and on a quest to take control of the gossip about himself, Butter sets up a website where he announces he will eat himself to death live on the Internet on New Year’s Eve. He expects pity and gossip, but he really never expects this announcement to gain him acceptance with the most popular kids in school. As the deadline approaches, Butter has some decisions to make: go through with it or live with what people will say if he “chickens out”. This book is cleverly written and humorous, while at the same time emotional and dark. Lange captures teen angst coupled with the sorrow of being an outcast perfectly, while giving Butter a strong, witty voice. I laughed out loud at the way Butter tells his story, but I also found myself wishing I could dive into his world and either hug him or shake him. 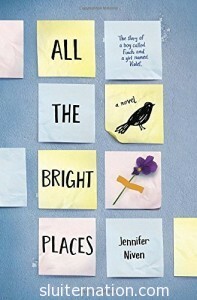 Next up is All the Bright Places by Jennifer Niven. Oh this book. This is a book about Theodore Finch and Violet Markey. They are high school seniors who run with totally different crowds. Finch is a “freak” who is fascinated by death–and how he might die. He is constantly striving to stay awake and alive. He looks for a reason each day to stay in this world. Violet is completely focused on graduation and getting out of their tiny Indiana town. She feels defined by her sister’s death and is finding a hard time going back to her old friends and hobbies. Finch and Violet meet on the ledge of a bell tower at their school and ultimately save each other. They end up partners in a Geography project that has them “wandering” all over the great state of Indiana and then report back to their class. Clearly they are thrown together in love…but their story is so heart-wrenching and beautiful. If you liked Eleanor and Park by Rainbow Rowell, you will LOVE this book. If you didn’t care for Eleanor & Park, you will still love this book. It puts suicide and mental illness in a new light. 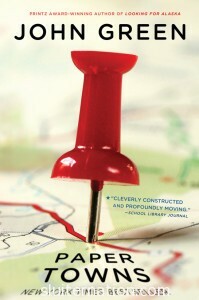 My next pick is Paper Towns by John Greene. “Like a metaphor rendered incomprehensible by its ubiquity, there was room enough in what she had left me for endless imaginings, for an infinite set of Margos” (173). Quentin and Margo have lived next door to each other in Orlando, Florida their entire lives, but run in different crowds (notice a theme here? Come on, it’s YA lit). Quentin hangs out with mostly kids in band and likes his self-proclaimed boring routine. Margo is exciting and popular and pulls all sorts of crazy stunts like running away and spending the night in Disney World. One night, Margo shows up at Quentin’s window and takes him on a ridiculous night-long adventure, but then disappears. It seems she has left clues, but they are for Quentin to figure out. What happened to her? I read this book over a weekend, but if I had not had children needing me, I could have easily read it in one sitting. It’s fast-paced and hard to put down. I wanted to know what in the heck was going to happen! I also love the way John Green portrays teenagers. Some criticize him for making characters that are not believable, but as someone who has taught teenagers for twelve years, I can say that teens like these do exist. And they are my most favorite. 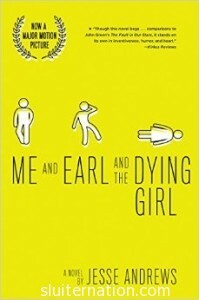 My last pick is Me and Earl and the Dying Girl by Jesse Andrews. I grabbed this book from Barnes & Noble because I had a 20% off coupon on top of my membership discount. And the back of the book said it was the “funniest book about death” ever. Sold. Greg is a high school senior who gets along with everybody, but has no actual friends. Well, other than Earl. And Earl is not so much a friend as a “co-worker”. They make films together. Terrible films that they show no one because they are terrible. Greg’s mom makes him hang out with Rachel, who is dying from Leukemia. And that’s when things get weird. The hilarity of this book is how honest and self-deprecating Greg is. He lets the reader know right off the bat that this is not a heart-warming “cancer book”. He does not fall in love and he claims not to learn anything. In fact, he thinks he may be worse for the entire experience. I don’t know if I agree with him, but I think the story is more of what might happen in real life than say, The Fault in Our Stars. There is some bad language and sexual humor, so reader beware if that is something that offends you. What is your favorite YA book? What are you (and/or your teen) reading this summer? I want to know what to put on my reading list/classroom library list next! If you’d like to donate to my classroom library, I just updated it with a bunch of junior high titles. Almost 500 books to choose from to donate, many under $8 each. I also created a DonorsChoose profile that collects donations toward my project–50 books for my classroom library. Book links are affiliates. That means if you click and buy, I get a couple cents. Just trying to earn some Amazon dollars to buy books for my classroom library! These all sound so good! I want to read them.